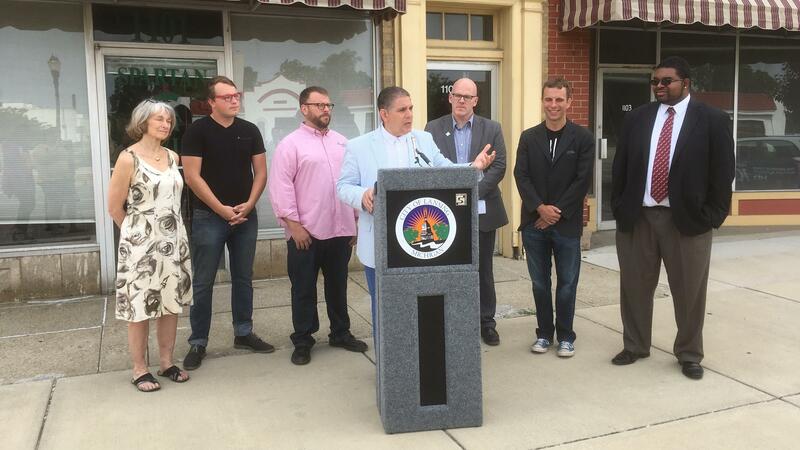 Left to right: Joan Nelson, Allen Market Place; Ryan Wert, Super Fancy Too; Sleepwalker owner Jeremy Sprague; Mayor Virg Bernero; Steve Willobee, LEAP; Wheel House Pottery owner Dan Nuñez; and Eric Pratt, LEAP. Lansing officials have announced that a couple of businesses will redevelop two buildings in REO Town, further transforming that part of the city as a destination. WKAR's Scott Pohl reports on plans to bring Sleepwalker Spirits and Ale and Wheel House Pottery to Lansing's REO Town. Sleepwalker Spirits and Ale is planning to move their craft beer brewery and restaurant from the kitchen incubator in the Allen Street Market Place to the corner of South Washington Avenue and Elm Street. The second floor will be transformed into office space. Sleepwalker owner Jeremy Sprague says "our goal is somewhere between Nine Inch Nails and Dr. Dre," Sprague quips. "That's what we're going to do, sprinkled with a little bit of Danish and typical microbrewry design." Next door, Dan Nuñez is planning to open the Wheel House Pottery Studio. While primarily an instruction space, Nuñez has additional plans. "I want to see if I can provide mugs and espresso cups to the coffee shop on the corner," Nuñez says, "get a mug club going with Sleepwalker Ale, and do whatever I can to make this a community spot." The second storey above Wheel House Pottery will be made into apartment space. Sleepwalker Spirits and Ale could open by the end of the year, while Wheel House Pottery will likely open late next year. Some new things are happening in Reo Town. Lansing rapper Mikeyy Austin is one of the minds behind Reo Town Sessions, a monthly event that highlights local artists and connects them to the community. Local rappers Mikeyy Austin, Sareem Poems, and Ozay Moore discuss the Black Arts Matter Celebration.